Philadelphia mayor Jim Kenney doesn’t want to begin his tenure by tinkering around the edges of city policy. He wants to try something big. Last year he won the Democratic primary by the largest margin of any Philly mayoral contender since the 1970s. Now, less than five months into his administration, he wants to cement his term with a huge policy win: taxing sugary beverages to fund universal pre-kindergarten programs for thousands of youngsters, among other initiatives. Kenney’s proposal is one of the most ambitious of any soda surcharge proposed over the years: three cents an ounce, levied on the distributors, which would be earmarked towards specific and very popular programs. Diet sodas would not be covered, but sports and juice drinks would be. The mayor’s office estimates that the tax would bring in over $400 million over five years, with $256 million going to pre-K, $56 million going to support parks and rec centers, $39 million going to community schools, and the rest going to myriad other programs. Kenney says that he’s going after the soda industry because Philadelphia simply doesn’t have any other revenue options left. After years of trying plug holes in the city and school-district budget, especially after the sweeping education cuts enacted by former Republican governor Tom Corbett, taxes have been raised on almost everything else. And, he argues, it’s about time the soda industry gave back to the communities that have made them rich. In this famously fractious and cash-strapped city, ambitions this grand are rarely attempted, let alone accomplished. And a soda tax is a hard sell even in the most liberal locales. Some 30 cities and states have floated soda-tax proposals, and all have failed with the exception of Berkeley, which successfully levied a one-cent-per-ounce tax that passed by voter referendum in 2014. (In the 1990s, a few states succeeded in passing similar taxes, but on a much smaller scale: Arkansas charges two cents per every 12 ounces sold and the money is earmarked for Medicaid.) Such proposals often flame out because their proponents have to wage a two-front war—against the soda industry, which is fighting desperately to avoid becoming the next tobacco industry, and against progressive forces who fear the tax will be too regressive. Still, Kenney’s proposal stands a real chance. By earmarking the revenues to programs that are at the top of the progressive agenda, Kenney has provided a strong counterargument to those concerned by the regressive nature of the tax: The money will go right back into those very neighborhoods that are hit hardest. And by selling the tax purely as a funding mechanism, and avoiding the arguments about personal health, he has removed the whiff of eat-your-vegetables condescension that so often accompanies these proposals. All of which means that Big Soda is right to be worried—and progressive lawmakers are right to be taking notes. If Kenney succeeds in taxing the beverage companies, even at a less robust level, Big Soda runs the risk of becoming the next go-to industry for revenue-starved city governments looking to bring support and services to its residents. As the federal government remains gridlocked and state governments are largely controlled by the Republican Party, cities have become some of the most fertile spaces for progressive change in this country. When Kenney was elected, national publications praised him as the latest evidence of a progressive tide sweeping America’s cities. In 2014, Bill de Blasio and Marty Walsh became the chief executives of New York and Boston, respectively, after years of business-friendly leadership by centrist and Republican mayors. Kenney was cast as one more heir to this urban populist trend. 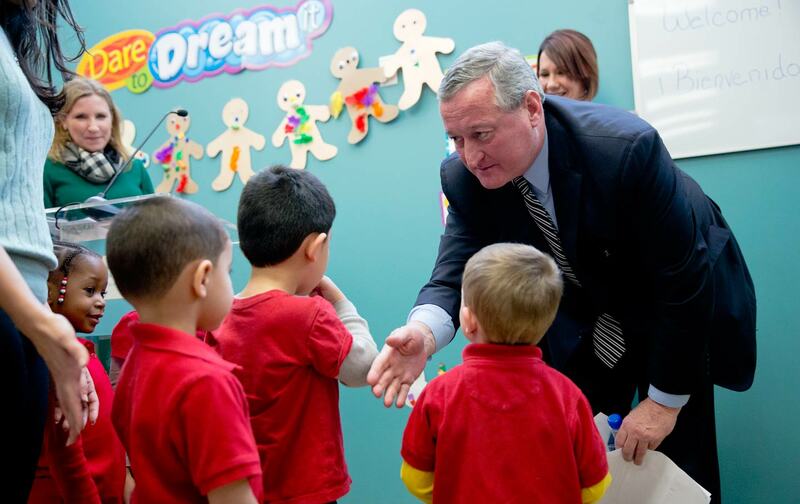 Like de Blasio, Kenney put universal pre-K at the center of his agenda, but during the election he remained mum about how he would pay for it. Philadelphia doesn’t really have enough rich people, or major industries, to successfully tax the rich for revenue as de Blasio attempted to do. Then, two months into his term, he revealed his revenue mechanism of choice: a tax on sugar-sweetened beverages, a policy he had voted against twice before under the prior mayor, Michael Nutter. Nutter’s smaller proposals in 2010 and 2011 were first pitched as a means to fight obesity and then as a way to help the embattled school system. In each instance, he framed the proposals as health initiatives that had the added bonus of bringing in some revenue to the city or the school district. That may be why they were so unpopular on the City Council, although it was probably because they were brought by Nutter, whose relationship with the city’s legislative body was famously fraught. Kenney’s evolving stance on sugary beverage taxes is but one small facet of the helter-skelter battle lines that have formed around this, the largest policy initiative in Philadelphia’s recent history. In this fiercely Democratic city—Mitt Romney didn’t receive a single vote in some wards—the battle is between liberals, leftists, labor unions, and, perhaps most of all, hyper-local factions. The soda industry has, of course, rallied against the proposal, arguing, among other things, that it will be ineffective since it will drive down soda consumption by almost 80 percent. (Outside experts disagree that consumption will drop so dramatically.) The teamsters, who represent the drivers who deliver soda and workers in the two bottling plants in Philadelphia, have also joined the opposition. In an odd twist, Bernie Sanders came out against Kenney’s plan, citing concerns about the regressive nature of a tax that targets products favored by lower-income people. (His op-ed in Philadelphia magazine ignored Pennsylvania’s constitutional uniformity-of-taxation clause, which means that the city has to impose taxes at the same level on everyone and cannot tax the rich, as Sanders recommended.) Several City Ccouncil members have expressed similar concerns. Meanwhile, Hillary Clinton has given it her blessing. In the City Council, where the fate of Kenney’s proposal rests, the sides are still not completely clear. The Philadelphia Inquirer reports that the powerful and sphinxlike City Council president, Darrell Clarke, is reportedly considering taxing sugary drinks at one cent, three-quarters of a cent, or half a cent an ounce and shrinking the scope of the pre-K proposal. Confirmed opponents include councilman at-large Al Taubenberger, West Philly’s Jannie Blackwell, and Maria Quiñones-Sánchez, a highly respected Puerto Rican council member who recently described her politics in Philadelphia magazine as “socialist, kind of.” Although some of these factions (the Teamsters and the industry, for instance) are concerned with their material interest, others are probably trying to score points against Kenney or are genuinely ambivalent about a tax that will probably be passed on to the city’s poor neighborhoods. The forces backing Kenney are equally diverse. After the mayor proposed the tax, the city’s Chamber of Commerce praised his pre-K plan and stayed mum on the sugary-drink tax, while Comcast’s David Cohen, one of the most influential business leaders in Philadelphia, hinted his support. Former New York mayor Michael Bloomberg is backing the tax as well, and putting his own money towards the campaign in favor of it. Many of the city’s service- sector and public-sector labor unions have signed on in support of Philadelphians for a Fair Future, the umbrella group in favor of the tax, as have a myriad of community groups ranging from the Latino advocacy organization Aspira to the Bicycle Coalition of Greater Philadelphia. Several City Council members seem well-disposed towards it, including majority leader Bobby Henon and progressive champion Helen Gym. Notwithstanding the mash-up of personalities and politics, the soda tax does stand a chance. All Kenney needs to win are nine votes on the 17-member council. After spending 23 years as a well-liked member of that body, he clearly expects to be better at wooing his former colleagues than Nutter proved to be. So far he only has three definite no votes, although Clarke’s counter offer doesn’t seem like a good sign for the achievement of the full scale of Kenney’s ambitions. And in the internecine conflicts that define Philly politics, there are no doubt plenty of interests and factions who wouldn’t mind humbling the new mayor. The deciding action is expected in June. But if Kenney’s proposal has splintered traditional allegiances at home, on the national stage it is gaining a great deal of attention as the latest front against the soda industry. Even if the mayor is forced to retreat—and many have speculated that three-cents-an-ounce was an excessively high opening gambit—Clarke’s counterproposals signal that Big Soda’s effort to stymie any tax on sugary beverages could well be doomed. If Kenney succeeds in taxing the beverage companies, Big Soda runs the risk of becoming the next go-to industry for revenue-starved city governments. While a huge reduction in the tax would disappointment Kenney and his supporters, any tax could open the soda industry to the same kind of persistent proposals that now bedevil the tobacco industry. And in an era where raising taxes on the wealthy and big business as a whole is excessively difficult, progressives may have to settle for breaking one industry off from the herd. Correction: An earlier version of this piece listed councilman Allan Domb as a confirmed opponent of Mayor Kenney’s soda tax plan; it should have listed councilman at-large Al Taubenberger instead.